Riverboats depart every 30mins or every hour, depending on the company, from 10.00 to 18.00 March to October and from 10.00 to 17.00 November to February. The brewery museum is open every day from 10.00 to 17.00. This ticket allows you to jump the queue at any time is good to visit although, cruise boat and the brewery may be less crowded in the mornings or late afternoon. We are comparing Heineken Experience and Canal Cruise Tour Amsterdam Prices from leading ticket suppliers and Try to find you Cheap tickets prices on the market. Gather your friends and travel companions and jump on board one of Amsterdam's riverboats. 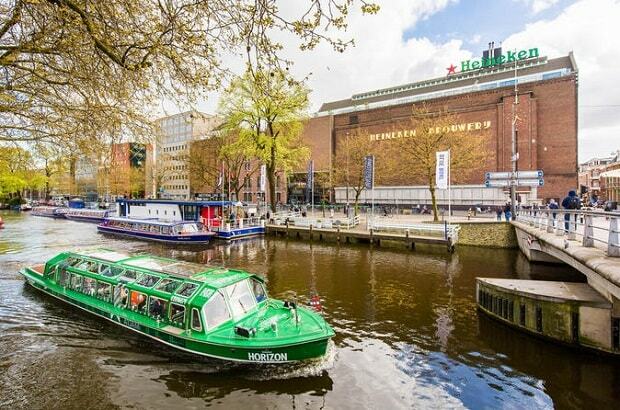 Float along the canals as you make your way to the famous Heineken Brewery. You can also make the trip in reverse if you prefer to visit the brewery first. Learn how one of the world's most popular beers is brewed and bottled before ending the 90-minute experience sampling the beer itself. While on board you will see some of Amsterdam's most beautiful buildings, interesting bridges and unique neighbourhoods. This is an opportunity to cruise through Amsterdam's historic centre and learn about the UNESCO site from a convenient multilingual audio guide. With this combined ticket you can decide your own itinerary, choose from any of the daily departure times and skip the line when you arrive at the Brewery. Ideal for beer lovers as well as people interesting in the brewery prosses. Great for people who want to explore the city, a 1-hour canal cruise will take you to the heart of historical Amsterdam. Fantastic for friends and families. Convenient for people who are on a short city break. Your Experience With Heineken Experience and Canal Cruise Tour Amsterdam ? Combine 2 of the top things to do in Amsterdam in just a few hours. Take a scenic river cruise on Amsterdam's canals and visit the Heineken Experience for a self-guided tour of this world-famous brewery. While onboard you'll float through the UNESCO protected part if this historical city. Pass by quirky boathouses and 17th century buildings. Benefit from an onboard multilingual audio guide. Save time by skipping the queues to the Heineken Experience. Tour the exhibition at your own pace and have the option to chill out in the onsite Heineken bar. What Heineken Experience and Canal Cruise Tour Amsterdam Includes? Fast track entrance to the Heineken Experience. Amsterdam Canal Cruise – Heineken Experience. Travelers Reviews about Heineken Experience and Canal Cruise Tour Amsterdam ? TripAdvisor and Viator share over 120 reviews for this tour with an average score of 4.5 out of 5. Get You Guide users have also given this tour a 4.5-star rating. Many travellers say that they had a very fun experience at the Heineken brewery. Comments agree that this is a must-see attraction while in Amsterdam. All riverboats are wheelchair friendly and the Heineken Brewery is fitted with electronic lifts so it is fully accessible. You must bring your ticket either printed or as a mobile voucher. Tickets are valid from when you exchange your voucher. Your must book your slot for the Heineken Experience, no need to pre-book the river cruise. Food and drinks are not included on the river cruise. The Heineken Experience is also suitable for children.